Increase the height of your Grand Cherokee with the Rubicon Budget Boost. This kit is just what you need to fit a larger tire and increase the ground clearance of your WJ (Grand Cherokee), giving your Jeep a more aggressive stance. 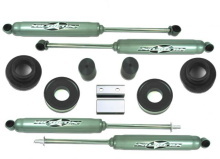 Specifically valved Rubicon twin tube shocks are included in this kit to improve your ride quality and properly limit suspension travel.